People have been using sandbags to train with for hundreds if not thousands of years. This is especially true for wrestlers and fighters as they have found that this type of training helps to increase their speed and flexibility. Currently sandbag training is receiving a lot of attention but just as with Kettlebells people are confused by how to train with them. Training with Sandbags is very similar to training with Kettlebells and many people like to incorporate both into their fitness regimen. Both workouts will challenge your strength and endurance and is an excellent workout for your core. When looking for a good sandbag you want to find one that allows some movement within the bag itself. What this does is to make you constantly need to make minor adjustments to keep your balance and to keep holding onto the bag. Sandbags are awkward to hold because of their weight, size and shape. Sandbags make your body use more muscles to use more energy. This helps you burn fat quickly and easily while building strength at the same time. One area where sandbags can really assist you is by helping you increase your grip strength. The most frustrating thing about some Sandbags is that there is really no convenient spot to hold onto. You must always be looking for somewhere to hold and just holding the bag makes you exert a lot of pressure with your grip. You will be using a crushing and pinching grip type of movement. This is why Sandbag training is perfect for those who want to improve their grip and hand strength. Purchasing a new sandbag is not cheap but they are an extremely versatile piece of equipment. You can easily use them to perform a variety of movements including doing clean and jerks, squats, jogging, throwing, dragging and climbing. Another aspect of sandbag training is that it will not leave your bored. Plus, it is a fantastic activity for group and team training. 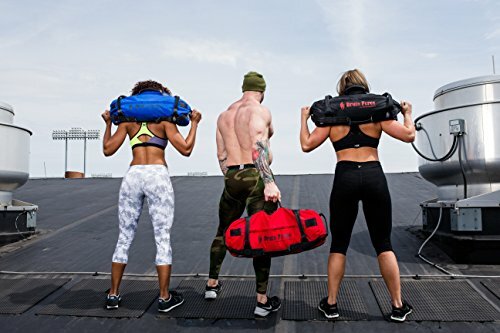 Sandbag training is a good fit for those who wish to combine strength and field work together while looking for a relatively quick but extremely effective workout. This particular type of training incorporates your trunk especially when you are attempting to run, do lunges, jump and while performing squats. Sandbags naturally incorporate instability just by their size whereas other pieces of equipment have instability in them such as exercise balls. What this means is that there is a ton of evidence to support that instability training is an extremely effective method of working out. Instability training equals sandbags! There are actually advantages for your body from lifting the odd weights and shapes of sandbags. When lifting with an odd shaped object you will have to hold your body differently and this is what will force your body to use different muscles. Just the larger size of the sandbag will have you rounding your back instead of keeping it straight as you would in most normal exercises. Even if you are not looking to become a weight lifter or participate in the MMA lifting sandbags can still be beneficial. Learning how to carry and move awkward objects can really help you at home. The next time you need to move furniture or carry a heavy box home from the store you will have the strength and the energy to do so. You may just want to be able to pick up your grandchildren or carry your groceries home and training with sandbags can help you achieve this. Before buying any sandbags you want to decide what your ultimate goals are that you want to get from your training program. Some good examples of goals include increasing your strength, endurance and speed. Circuit training is a great way to maximize strength training. Density training makes use of repetitions along with setting a time period to perform each set of repetitions. The best way to explain this is for you to choose two different exercises along with a time period, maybe 10 or 15 minutes, depending upon your fitness level. All that you do is switch between the two exercises for the set time period. Many people enjoy working out with sandbags while using another piece of equipment such as a dumbbell. Or you can simply alternate the exercises and the equipment. By using sandbags of different weights you will be challenging other muscles while allowing your body to recover. Remember too that the weight of your sandbag will depend upon your goals. If you are a woman trying to lose weight you really don’t want to use such a heavy sandbag which you can hardly lift. You want to use a weight that is a challenge but still manageable so you can get into that burning fat mode. For men who want to build muscle it wouldn’t make sense to use an easy weight. In order to build muscle, you need to push and challenge your body. The appearance of sandbags is changing and many today look like military bags. Many actually do have physical handles that make it easier to hold onto the bag. Certain sandbags come with additional filler bags so you can easily increase your weight as necessary. Obviously these types of bags will be more expensive but they may be easier to use, will last longer and will help you achieve your goals effectively. Some people have tried making their own sandbags. While, yes, it is cheaper for sure the most common complaint is that the bags begin to leak. Homemade bags are notorious for creating lots of dust when being used. Plus, the material can be very rough on your hands. Newer bags are waterproof, very strong and resistant to oil, mildew and dust. Plus, they will not rip, tear and are not rough on your hands and body. Sandbags literally do come in all shapes and sizes. You can purchase smaller sized sandbags that are light and can be carried around your neck. This type of sandbag is perfect for taking on your daily walks and will help you increase the intensity of your workout. Trainers are incorporating the use of sandbags into their training sessions and their clients love it. These types of bags add variety, fun and intensity to any workout. Remember that the wonderful thing about training with sandbags is that you don’t have to join a gym. You definitely want to keep this in mind when purchasing your sandbags, gym memberships are expensive so compare the costs before making your purchase. There are several ways to get started with your sandbag training program. One is to simply go to YouTube and find some videos to watch. This can be a great way to just test out this type of training and see if it is something for you. Once you are certain that you want to continue with sandbag and even kettlebell training you can purchase complete training programs. Training with sandbags is also good for those of you who are dealing with body pains. This type of training is reputed to help relieve stress on your muscles. If you have serious pain issues be sure to consult your doctor before beginning any exercise routine. There have been some very encouraging reports of people with back pain getting relieve after taking up sandbag training. As well as targeting pain this type of training will get your body moving more and becoming more flexible. There are side benefits to training with sandbags one of the most noticeable is that you will notice improvements when performing different activities. This will reflect when you go and do barbell training including snatches and lifts. You will find that you can lift more weight more effectively and easily. Sandbag training can be highly recommended for those people who are looking for a big bang for your buck. 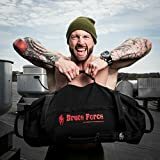 For people who are looking for more natural human performance workouts then sandbag training fits into that category perfectly. The challenges that sandbag training creates is very effective for your entire body. You will notice that no matter what weight of sandbag you use you will feel and notice your body becoming more supple and flexible. Many of these exercises can be incorporated with other pieces of exercise equipment such as a step and as we mentioned before dumbbells. Many recommended training programs also include incorporating some type of running or walking program. This helps to increase the effectiveness of your sandbag training. Of course you can start off by walking fast and then turning this into a run. After a good workout you will feel sore and this is perfectly normal. In fact, numerous people say that they are sorer than when using the same weight with a regular dumbbell. This is because the size and weight of the sandbag forces you to use muscles that you cannot access by using a dumbbell. This type of effect is known as stabilizer strength training. Kettlebells work in the same way which is one reason why this method of exercise is becoming increasingly popular. Professional athletes enjoy working out with sandbags because of the motion which can be attained. A training session will allow an athlete to duplicate the same motions that would occur when you are playing the sport. This can really help you benefit and enhance your game play. Training with sandbags is really a cost effective way of training at home. It is fairly simple to set up your own home gym in your garage or in your basement. Lots of people like to include a chin up bar, dumbbells and a step. Of course, you don’t even need all of this. There are so many different exercises and possibilities of what you can do with sandbags that you should never get bored. As you can see training with sandbags and/or kettlebells can be an affordable way to workout at home. This type of training is perfect for people who want to lose weight all the way up to people who wish to become a professional weight lifter. This is not one of those certain types of sports and is even great for your entire family. Younger members can use less weight while someone who wants to lose weight can increase their repetitions to help burn fat and calories. Buying a flexible sandbag that you can add filler bags to it will be easy to ramp up the weight as and when necessary.